The Cabinet Secretary for Finance Derek Mackay says he has delivered a “good deal” for Scottish councils in the local government budget settlement. Well that’s a relief! Or it would be if it was true. 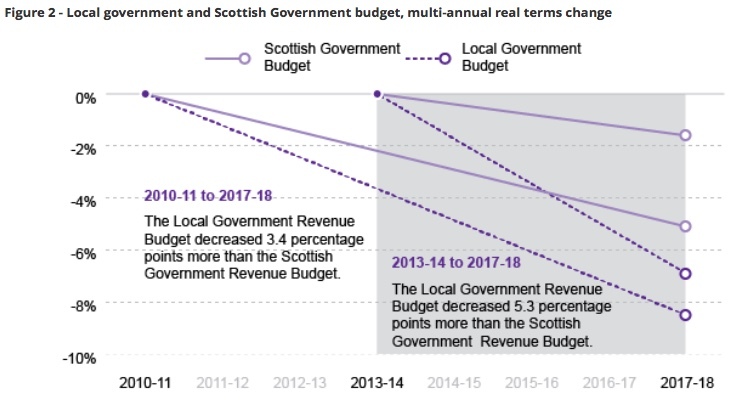 Lots of numbers are bandied about in relation to the local government budget. I dealt with the most common confusion over a ‘real terms’ increase in a previous blog post. So, let’s try and decipher what’s going on in local government. The most damming statistic relates to jobs. If local government has had such a ‘good deal’ then why are nine out of ten austerity job losses in councils? For the coming year the allocation of £9.63 billion is a “flat cash” settlement, but it isn’t a like for like comparison with the previous year. Next year’s funding includes new Scottish Government policy commitments such as starting to implement the expansion of Early Years and Childcare and ring fencing teachers’ pay and classroom ratios. These add up to a total of £153 million and once they are deducted from the “flat cash” settlement, there is a cut of £153 million for core local government services. This table shows how this is calculated. Even if every council raised the Council Tax by 3%, it only raises £77m. Certainly not enough to plug this gap. The finance minister’s claim that this would deliver a real terms increase, does not stack up. We focus on revenue because that’s what pays for core services and of course pay. 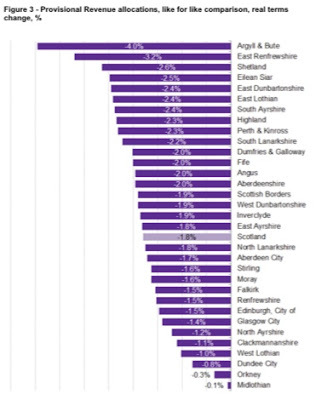 SPICe has estimated that, if local authorities were to match the Scottish Government's pay policy, this would cost around £150m (gross) in 2018-19. I think this is a little on the low side, but it’s difficult to be precise because of poor workforce data. In fairness, in real terms councils have 1% factored in for pay, so the gap is around £90m. We should also remember that because of the allocation formula the pain is not equally spread across councils. This chart shows the variations. The bottom line is that the finance minister has been told to protect half the budget. That means that the other half takes a disproportionate hit. Most of that is local government, so however you try and spin it, councils are not getting a ‘good deal’. To use a seasonal analogy, some of us may be feeling the after effects of the office party. Well, the Scottish budget could have a similar effect on public finances later next year. I have outlined the main impact of the budget on UNISON members in my budget briefing. One of the queries I often get from members is why there are different figures for the same budget or service. Public finance is confusing enough, even for budget geeks like me, without the added confusion. The first reason is political spin. Politicians will conflate budgets to make their point, and sometimes, even count the same cash twice. The ring-fenced education budgets are an example of the former and social care the latter. Another reason, and a legitimate one, is the presentation of a budget in 'cash' and 'real' terms. Cash is fairly straightforward. It's usually the amount on the cheque the public body will get from the Scottish Government - a bit like our own household budgets. Presenting a budget in 'real' terms is an attempt to reflect the impact of inflation. To show if a budget is being increased or reduced to reflect policy priorities or a change in service level. Inflation is the increase in the cost of living, usually measured by an index. The main ones are the Consumer Price Index (CPI) which excludes housing costs, and the Retail Price Index (RPI) which includes them. Wage negotiations tend to focus on the RPI because most workers have housing costs of some sort. The next complication is that when setting a budget the government is not looking at today's inflation rate, they are looking at forecasts for the next financial year (April 2018 to April 2019). This is done by the Office of Budget Responsibility (OBR) at UK level and the Scottish Fiscal Commission (SFC) in Scotland. The OBR has forecast that the CPI will be 2.4% next year and the RPI 3.3%. However, there is another inflation rate called the 'GDP deflator' which government's use to present budgets in 'real' terms. This uses a different basket of goods and services from the better known CPI and RPI measures. The OBR forecasts that this will be 1.4% next year. So, when a budget line is described by Scottish ministers as a 'real term' increase, they mean only if inflation keeps at or below 1.4%. Now, I personally think the OBR forecasts for CPI are optimistic, but I am pretty certain that 1.4% is not going to cover public service inflation in Scotland next year. For a starter, the Scottish Government pay policy is going to cost just short of 3% and that's 55% of the Scottish Budget. The NHS makes up a third of the budget and health inflation is always much higher than the standard measures. Then we have demographic change, which for social care requires a 2% increase just to standstill. I could go on, but you get the point. And let's not forget that local government isn't getting even this kid on real terms increase - they are getting a flat cash revenue settlement. 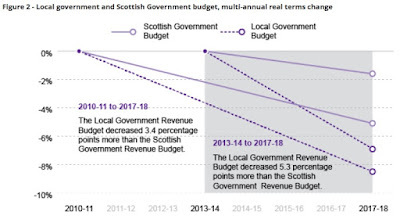 In real terms the local government budget is cut by £135m, COSLA thinks it is closer to £154m. If you apply the points I make above, it's probably even bigger than that. To give some context, a 1% pay rise costs councils around £70m. The concept of a 'real terms' pay increase also comes in here , given the Scottish Government pay policy. Even if RPI falls to 3.3% next year that still leaves those earning below £30k, who are promised 3%, out of pocket. Much more of a loss for those above £30k, who are only promised 2%. In summary, I fear that if we swallow this draft Scottish Budget we will be left with something of a delayed hangover later next year. 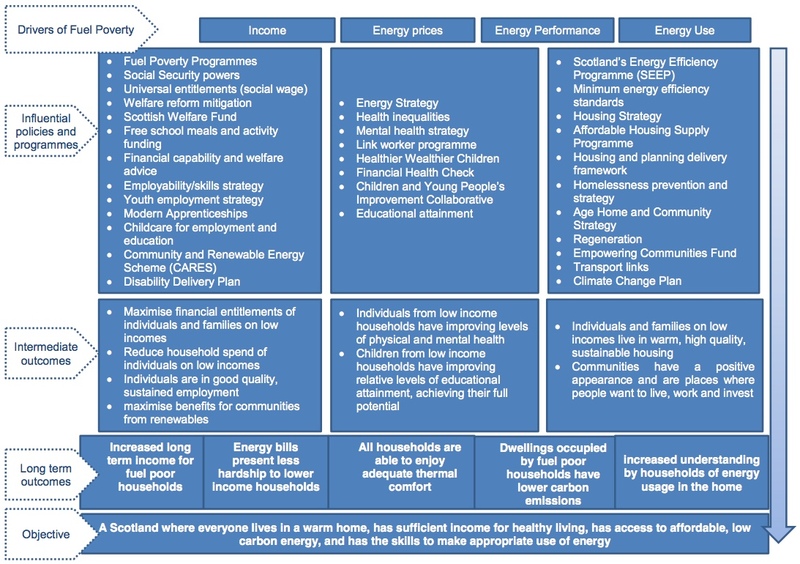 As the statutory target to eliminate fuel poverty in Scotland has come and gone, will a new strategy do any better? The Scottish Government has published a consultation paper on a new fuel poverty strategy for Scotland. The consultation looks at the existing approach and legislative framework and sets out proposals for a new Fuel Poverty Strategy in Spring next year. Targets will be enshrined in a Warm Homes Bill later in 2018. The number of households in fuel poverty fell slightly in the latest Scottish House Condition survey thanks to falling fuel prices. However, still almost one third of homes suffer under the current definition and the numbers are likely to rise again with the latest fuel price increases. The new definition excludes housing costs and is intended to focus attention on low income households, rather than the 47% of the current fuel poor who are not income poor. There will still be challenges in reaching the standard heating regime because households self-disconnect, due to low incomes. Cuts in social security will exacerbate this. While the new definition is certainly more complex, it does target efforts on the right group. Although with insecure work, varied incomes are more common and many households are likely to fall in and out of the definition. 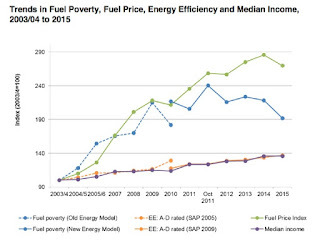 There are three main elements to tackling fuel poverty - the price of fuel, energy efficiency/use and household income. The first is largely reserved, although energy policy is a factor. 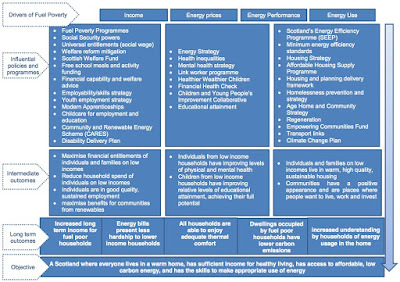 Energy efficiency is devolved and household income has devolved and reserved elements, including social security. This means the strategy rightly has a focus on energy efficiency. Ambitions are fine, but investment is better. The Scottish Government cut funding to £45m in 2007/08; largely because they thought the problem had been resolved. It has now recovered to £129m, although this is well below the £200m Energy Action Scotland warned was needed to meet the 2016 target. There are some particular challenges in Scotland. Not only are we a cold country, but fuel costs in rural areas are significantly higher. Typically, £2,200 in remote rural areas, compared to £1,400 in the UK as a whole. There are particular challenges in island communities. We also have large areas off the gas grid, which matters for heating. It is also important that we retain efficient area based schemes that strengthen communities, rather than just micro targeting individual households. The proxies used to identify fuel poor households generally work, but need to be flexibly applied to reflect local needs. The consultation paper is again strong on ambition. Objectives like 'Households are able to enjoy a warm home' is hard to disagree with. Achieving this apparently requires plenty of partnership working and linking in to other strategies. While this is probably true, it does feel rather process driven - hard targets, programmes and investment are in short supply. A number of the organisations currently working in 'partnership' complain about short term funding. They build up expertise and services and then the funding comes to an end. Publicity, online and telephone services have their place, but for hard to reach households it requires an advisor in the household. There has been an improvement in skilling staff like social workers and community nurses, since some of the early schemes UNISON did with the Keeping Scotland Warm partnership. However, we could do more in signposting people towards specialist advice. Local authority services are under particular pressure due to cuts. The new statutory target is to eliminate fuel poverty (new definition) by 2040, with a review at 2030. There is considerable scepticism of the description of this as 'ambitious', given the long timescale. We should have learned a thing or two during the past 16 years, to make another 23 year target a bit excessive. 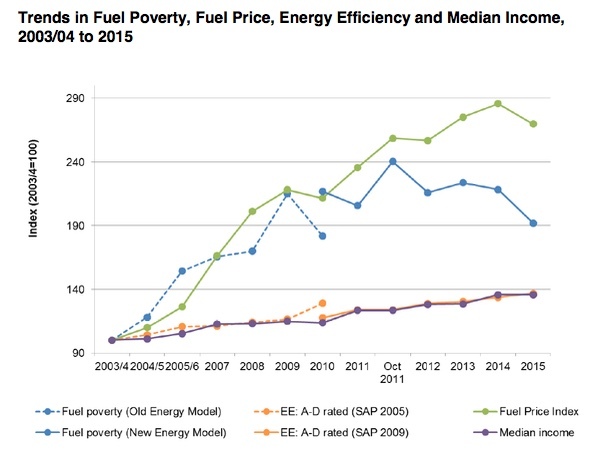 The problem is that achieving this target depends on a range of variables, particularly fuel prices and incomes. None of these are likely to be addressed without a serious political commitment to eliminate poverty more generally.